On Friday, August 15, 2014, the 14th Annual Fellowship Open and Luncheon was held at Silver Spring Golf & Banquet Center, located at N56 W21318 Silver Spring Drive, Menomonee Falls. The event featured a round of golf, a silent auction and an awards luncheon. 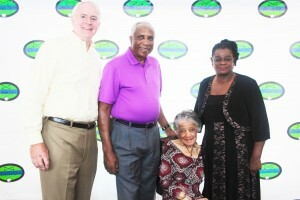 Pictured at the event are (from left) Milwaukee Mayor Tom Barrett; 2014 Legends Award Recipient and Major League Baseball Hall of Famer Frank Robinson; Community Leader Award Recipient, History Maker and Attorney Vel Phillips; and Congresswoman Gwen Moore, were among the hundreds of celebrities, business leaders and urban youth who attended this year’s event. Since its founding, the Fellowship Open has raised nearly $1,000,000 to support education and open paths to successful careers for Milwaukee’s children.